One of the many things that is wonderful about the North Norfolk coast is how dog-friendly the towns are--and how friendly the dogs. There's always a dog to say hello to (and I do), or to watch enjoying the beach. 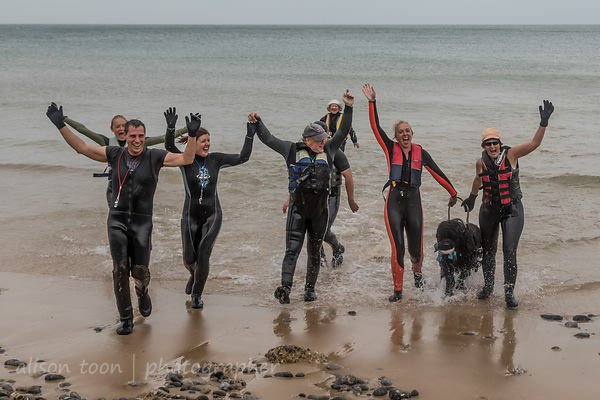 Whether a family retriever chasing a ball in the waves, a tall-and-graceful retired racing greyhound, a sedate corgi taking a stroll, or a springer spaniel determined to swim to Spain, dogs are welcome here. 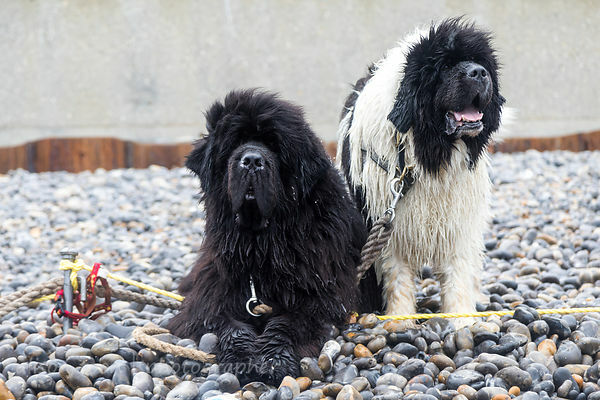 You don't, however, often see a beach entirely populated by Newfoundlands! That's what happened this morning, in Sheringham. 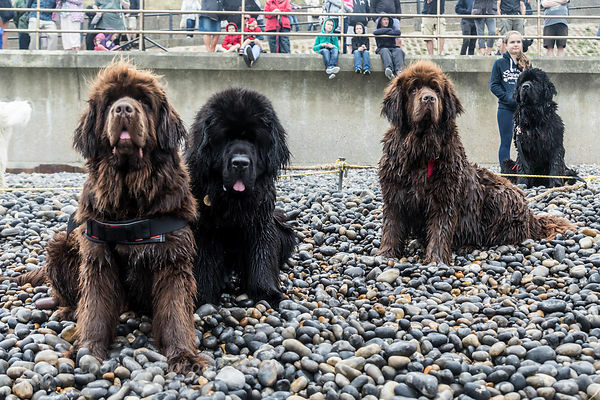 As part of the Sheringham Carnival, a group of Newfoundlands and their humans gave a demonstration of the work that these gentle giants are capable of. With their webbed feet, strong muscles, huge size and double coats for buoyancy and waterproofing, they swim, pull, tow and rescue. The dogs swam out from the beach, and pulled people back. They carried them a lifeline. They jumped from a boat and did the rescue. Two dogs pulled in a boat carrying three humans. And two of them towed back a chain of seven people each! And while each of the demonstrations was happening, all of the other dogs sat on the beach, watching intently, occasionally barking as if to say, I want to help, I want to rescue, here I am, I'm ready too. A seriously-giant breed, Newfoundlands usually weigh between 50-69kg (110-152lb). They are black, brown, or black-and-white (the black-and-white ones sometimes called "Landseer" rather than Newfoundlands). They are like giant retrievers with a little mastiff mixed in. Gentle, protective and kind to children too. Did you read J. M. Barrie's Peter Pan? The dog, Nana, was a Newfoundland. They can swim a long way, and in cold water and strong seas, too. Did that springer disappear over the horizon, yet? 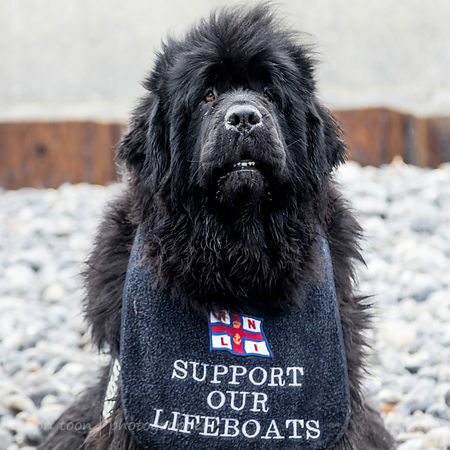 We might have to send a Newfoundland to rescue her, too! 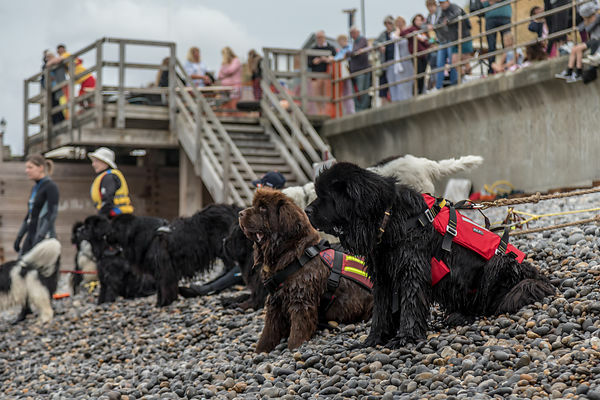 You can see the Newfoundland Working Dogs Display again soon, at Happisburgh next weekend and at Cromer Carnival, starting on Sunday 12th August on the East Beach (but check the carnival program for other times), and then in Hemsby. You can find all their events here. Find out what else is happening in Sheringham during the carnival here. And for Cromer's carnival here! 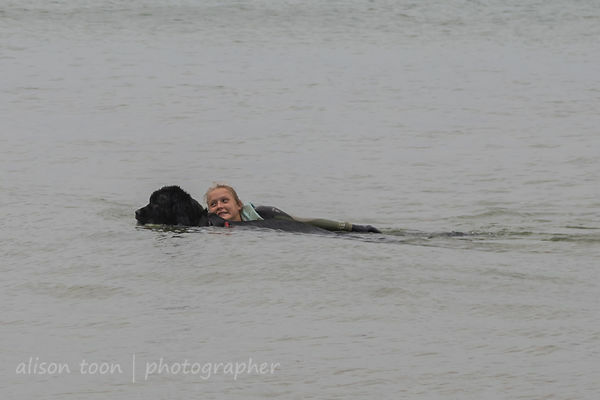 Many more photos of the Newfoundlands here in the photo gallery. Just click! One dog, many people rescued!